Though this does not seem like a very profound statement ... it is. While they did not come right out and say it, Lewin and Nadler both knew this statement to be true. 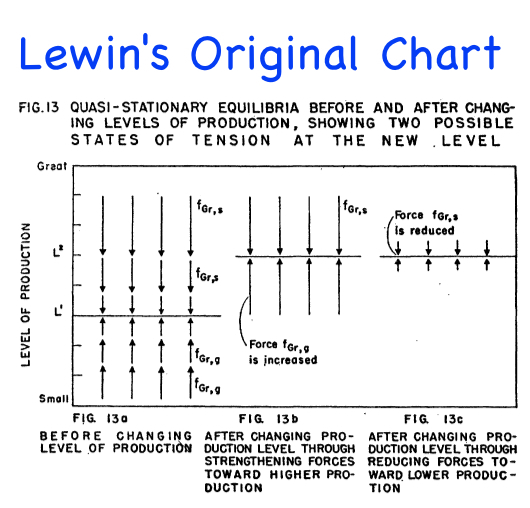 Lewin depicted this problem with organizational change in 1947. The chart below is an actual screen grab of the article. This is Lewin, himself, drawing up what a force field looks like in action. It depicts three different departments going through change. I'll call them Group A, Group B, & Group C.
Here is one key point: the length of the arrow means amount of energy used. Though it seems counterintuitive, the upward forces are management wanting to drive up production. The downward arrows are the forces against driving up production. Group A had no change management. Group B had top-down change management. Group C had participative change management. Top-down change management requires less energy than no change management. Participative change management requires less energy than top-down change management.